I said I would do a post on TWG Teas. Well here it is! 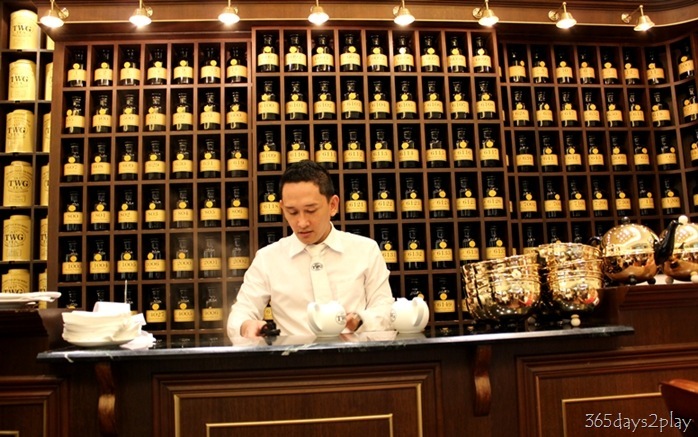 Did you know that TWG Teas was started by 2 businessmen in Singapore only about 2 years ago? They must have a really solid team working behind the scenes because it took them less than 2 years to get themselves branded as a premium tea seller. 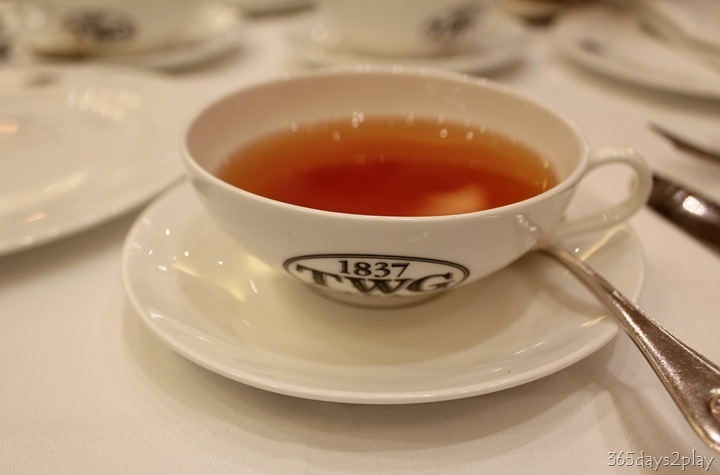 TWG is available at many upscale places such as SIA, Fullerton Hotel and even Harrods! 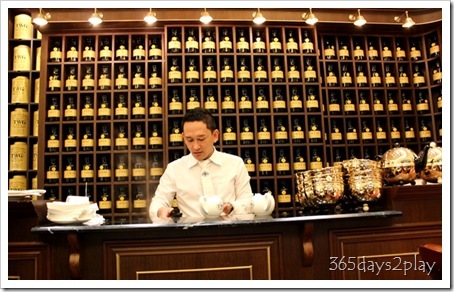 From the look of their 2 Tea Salons in Singapore, no one would fault you for assuming that TWG has been operating for years! 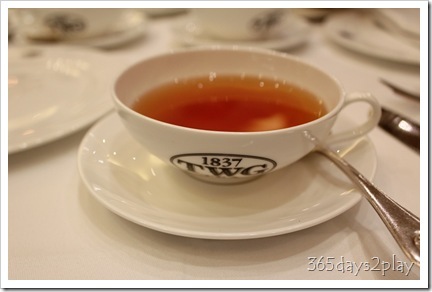 I’ve been to both the TWG Tea Salons at Republic Plaza and Ion Shopping Mall. The Ion salon seems to be packed all the time. When I was there on a weekend, I had to line up for 10 minutes before I got a table. They do take reservations for weekdays though. The seating area is rather small and very cramped. You can almost touch the person at the next table. Since people are there to relax over a cuppa tea after a hard day’s shopping, no one is in a hurry to vacate their seats. The Republic Plaza salon on the other hand was pretty empty save for a few corporate looking types talking business when we were there, and naturally so since few people purposely venture into the business district for fun. I will say this upfront, it’s not cheap to dine at TWG. 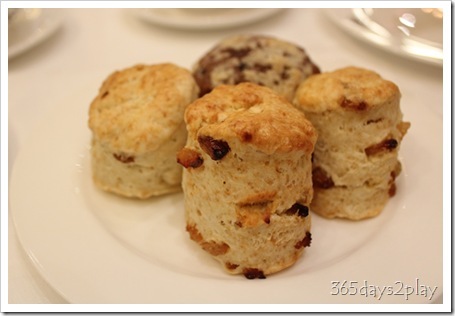 The tea-time set comprising a pot of tea and your choice of 2 scones or 2 muffin costs $17. 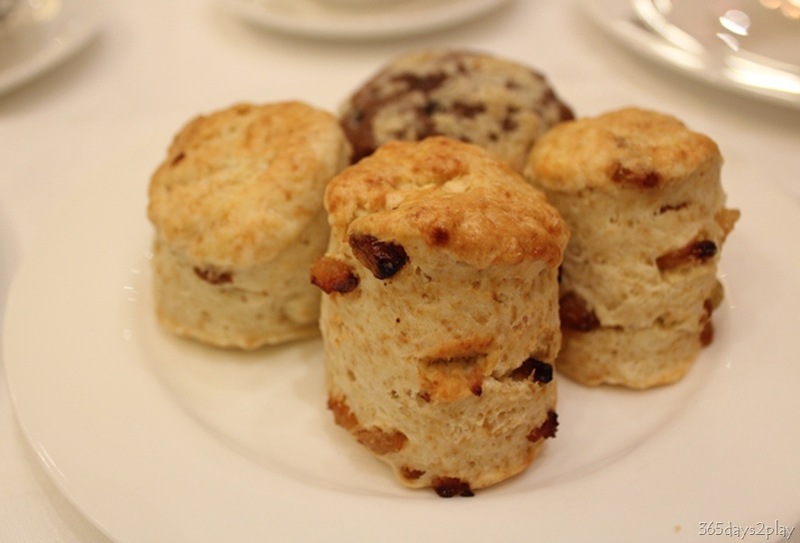 A pot of tea on its own is about $10.50, which means that each scone or muffin costs $3.25. Not cheap considering that the scones are on the small side. The scones were not too bad, but not spectacular enough to warrant the price. The muffin was a let down. 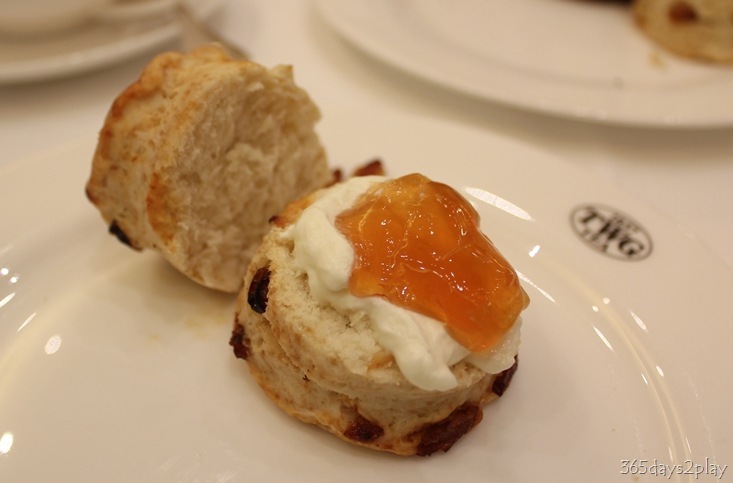 The scones do come with whipped cream and their unique TWG tea jelly. The jelly as some TWG tea infused into it, which is an interesting touch. However, the jelly, being jelly, was too wobbly and not sweet enough to go with the scones. The tea was very nice. They have an extensive tea menu for you to choose from that you almost become dazed at the 3 or 4 pages worth of tea names. Many of them have weird alphabets and numerals behind them, which kinda makes one wonder how it was possible to just survive with Lipton and Boh tea for the last 20 years. In any case, when faced with FTGFOP1, don’t look lost. Just know that it stands for Finest Tippy Golden Flowery Orange Pekoe 1. What that actually means is reserved for discussion another day heh. 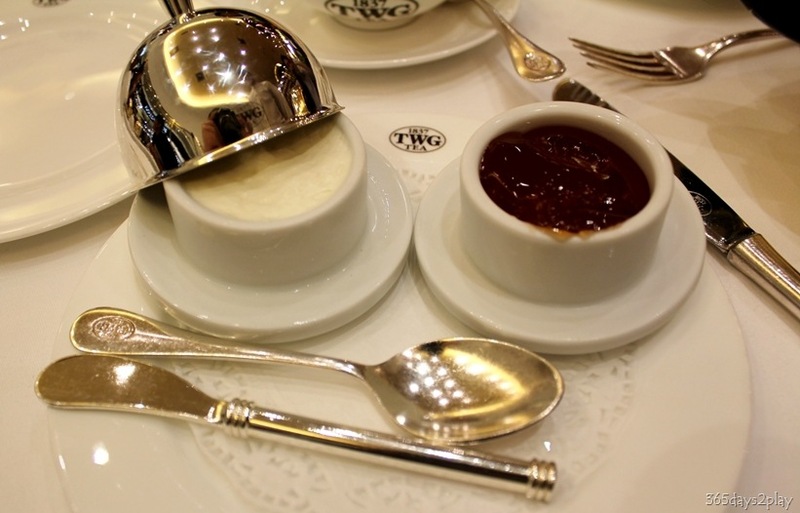 See the thing with TWG is that that 1 pot of tea costs $10.50. However, if you were to buy 50gms of the same loose leaf tea, it also costs the same $10.50. This 50gm bag of tea allows you to make more than 10 cups of tea. And tea is not difficult to brew at home. I’ve been having their Rwandan Express tea for breakfast and tea-time in the office nearly everyday. Secondly, if you have money to burn, won’t you rather pay a little bit more and spend your leisurely afternoon in the comfort of a spacious but equally if not more luxurious hotel lobby lounge? It will probably be more value for money. Compare TWG’s $25 set menu where you get the tea, 2 scones/muffins and 3 finger sandwiches, with Shangri-La afternoon tea buffet which offers 101 tea selections and afternoon tea buffet line at about $38. 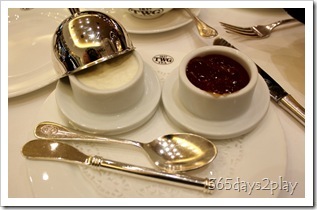 Or if you must have TWG tea, you can try Fullerton Hotel’s afternoon tea buffet at $36. Are you getting the drift here? Check out TWG’s menu for weekday and weekend and see if you fancy playing tai tai for a day.